1. For corrosive atmospheres and fiuids, resistant to high dynamic presure loads and vibrations. 2. Well suited for the process industry applications inluding: Petrochemical, Chemical plants, and energy etc. 4. 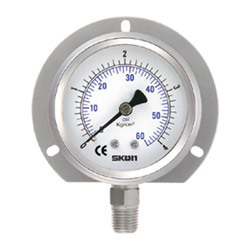 Operating temperature: working temperature: 100℃, Ambient: -25℃ ～60℃. 13. Window (1) normal glass. (2) acrylic. (3) laminated safety glass.